Spelt (Triticum spelta) is a grain in the wheat family that has been in cultivation for thousands of years. Some debate has occurred over the classification of spelt, with some botanists considering it a subspecies of common wheat and others saying that it is an entirely different species. Spelt fell out of popularity among grain cultivators due to the hardness of its outer shell, but with the advent of the health foods movement in the 1980s, spelt began to enter the popular diet again. In appearance, spelt looks much like wheat, with a dense cluster of kernels growing on an elongated stalk. When spelt is ready to harvest, the stalks turn golden and begin to bend under the weight of the heavy spelt kernels. Spelt is also harvested much like wheat, and the grain is separated from the chaff. The chaff can be plowed back into the field for mulch, used for construction projects, or used to provide animal bedding. Because spelt has a much harder outer kernel or hull than wheat, however, it requires more work to get the inner kernel out. The hull of spelt can be removed using special threshing equipment to access the kernel inside. It is believed that this hull acts to protect the kernel during shipping, making it fresh and more flavorful when it is threshed and ground into flour. More importantly, the hull protects the kernel from many insect pests and infestations, making spelt easier to grow without the use of pesticides. Much like wheat, spelt is ground into flour, with both white and whole grain incarnations available. Many bakers use whole grain spelt flour so that they can take full advantage of the nutrition that the grain offers. Spelt flour can be used like conventional flour in most recipes, although some adjustments may be necessary. For bakers who want to avoid the characteristic nutty flavor, white spelt flour is advised. Spelt contains about 57.9 percent carbohydrates (excluding 9.2 percent fibre), 17.0 percent protein and 3.0 percent fat, as well as dietary minerals and vitamins. As it contains a moderate amount of gluten, it is suitable for some baking. Because spelt contains gluten, it is not suitable for people with coeliac disease. Nonetheless, many other people with allergies or intolerances to common wheat can tolerate spelt. The nutrition information below is for a serving size of 1 cup of cooked spelt. A serving of cooked spelt has 246 calories, 10.7 g protein and 51.3 g total carbohydrates, including nearly 40 g starches. It is low in total fat, with 1.6 g per serving, and the grain does not provide cholesterol, since it is a plant-based food and cholesterol is only in animal products. Spelt is a form of wheat, so do not eat it if you have celiac disease and need to avoid gluten-containing products. Each 1-cup serving of cooked spelt provides 7.5 g dietary fiber, or 30 percent of the daily value for fiber for a healthy adult consuming a 2,000-calorie diet. Dietary fiber comes from the parts of plant foods that your body cannot digest, and health professionals believe it provides important health benefits. The Mayo Clinic states that high-fiber diets may reduce your risk for constipation, help you control your blood sugar levels and reduce levels of "bad" LDL cholesterol in your blood. Spelt has 3.25 mg iron, an essential mineral needes for healthy red blood cells. The 2005 Dietary Guidelines for Americans notes that women of child-bearing age and children are at higher risk for iron-deficiency anemia. The Linus Pauling Institute Micronutrient Information Center states that nearly every cell in your body needs phosphorus, and 1 cup of cooked spelt has 290 mg phosphorus, or nearly 30 percent of the daily value. Spelt can be a healthy food if you are trying to control your blood pressure. The 2005 Dietary Guidelines for Americans recommends increasing potassium and decreasing sodium intake to maintain a healthy blood pressure. Spelt is high in potassium with 277 mg, or almost 8 percent of the daily value, and it is nearly free of sodium, with only 10 mg per cup compared to the daily value of 2,400 mg.
Spelt is a nutritious species of wheat with a deep nutlike flavor. 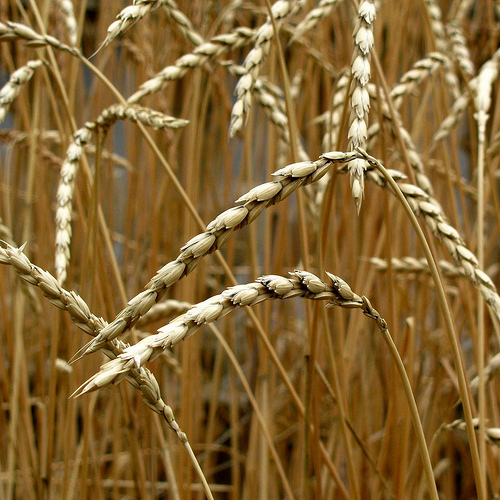 Even before many of the wheat hybrids, spelt has been used by people. It scores more over many other species of wheat in containing a rich source of nutrients. Spelt can be consumed in whole form known as spelt berries, hulled form or even in the form of spelt flour. It originally belongs to Iran and Southeastern Europe. It is one of the first grains which were used to make bread. It served as a staple grain for the ancient civilizations like Greece and Rome. Spelt is highly health beneficial and keeping this point in view we bring you the health benefits of eating spelt in the below lines. Spelt belongs to the group of non-scientifically established "gluten grains". People who are prone to wheat-related conditions like gluten-sensitive enteropathies or celiac spruce should consult their physician before consuming spelt.